Google now shows a list of facts next to some Wikipedia results. Knowledge Graph data extracted from Wikipedia is now placed below the snippets. 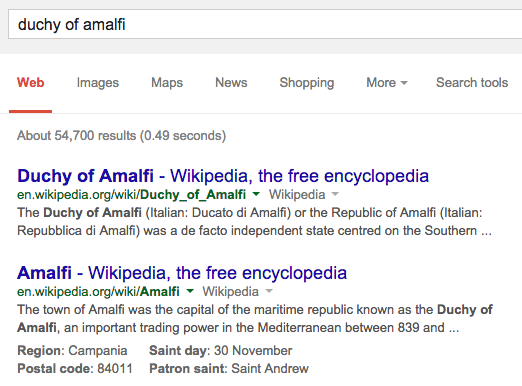 For example, when searching for [duchy of Amalfi], Google shows some information about Amalfi, a town in the province of Salerno and the former capital of the Duchy of Amalfi. When searching for [king of Rome], Google shows the name of the last king and the year when the monarchy ended. Some of the facts aren't very useful or are taken out of context. 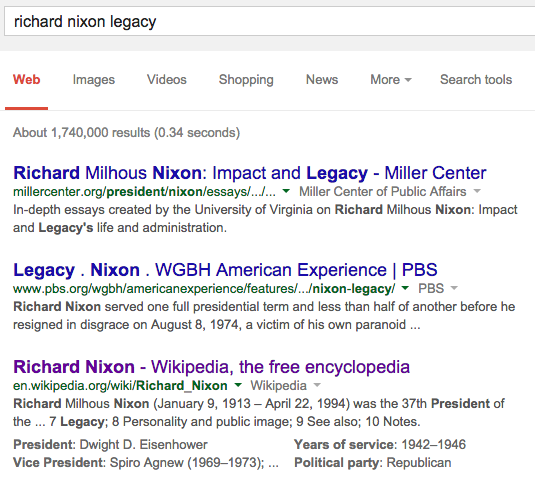 For example, Google shows "President: Dwight D. Eisenhower" next to the Wikipedia result for Richard Nixon, without mentioning that Nixon was vice president during the Eisenhower administration.